Cut 4-5 slits on one side of the eggplant and place it slit-side-up on a baking sheet. Trim about an inch off the top of the head of garlic, just exposing the tops of the cloves inside. Place the garlic on a piece of foil, drizzle it with a little EVOO, wrap it up and place it in the oven alongside the eggplant. Roast them both for about 30-40 minutes, until the eggplant looks like a flat tire. When the eggplant and garlic only have about 15 minutes left to roast, put the grape tomatoes on a baking sheet, drizzle them with some EVOO and season with salt and freshly ground black pepper. Transfer the tomatoes to the oven and roast for about 15 minutes. Place a large pot of water over high heat with a lid on it and bring up to a boil. Once boiling, add some salt and cook the pasta to al dente (with a bite to it), according to the package directions. Right before draining the pasta, remove and reserve about 1 cup of the pasta-cooking water. Once the eggplant, garlic and tomatoes are all roasted, remove everything from the oven. Split the eggplant open and scoop out all of the roasted flesh with a spoon, discarding the skin. Transfer the flesh to a large serving bowl, along with the roasted tomatoes. Squeeze out the roasted garlic flesh from the papery shell and add to the eggplant and tomatoes. With the back of a fork or a potato masher, smash up the eggplant, tomatoes and garlic until thoroughly combined. Add the torn basil, salt, freshly ground black pepper and the reserved pasta-cooking liquid to the bowl, stirring and smashing to combine. Add the pasta and toss until thoroughly coated. 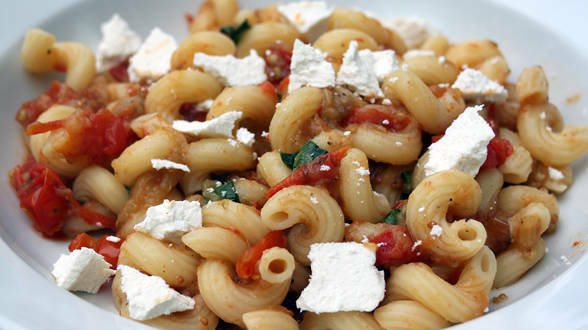 Divide the pasta between four serving bowls and top each one with some of the crumbled ricotta salata or a large dollop of the ricotta cheese. Serve with your favorite salad alongside. In Recipes-list.com we have selected the most viewed recipes from category - uncategorized . Enjoy the best recipes specially selected for you! Roasted Pasta alla Norma (Roasted Tomato, Eggplant and Garlic Pasta) is the right choice that will satisfy all your claims.